I watched a weepie last night. 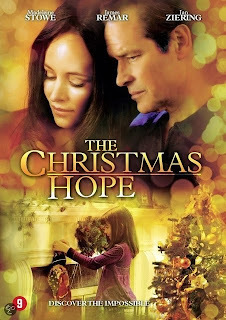 It was a film made in 2009 called "The Christmas Hope" that tells three stories of how individual persons having lost something, gained something else back as Christmas Day approaches. It is a feel-good movie that begins with tragedy and closes with a teary end. The first scene is about a single mother and daughter (Emily) hugging and enjoying each other's company. Emily's mum works as a waitress and tries to make ends meet. Emily is an adorable 9-year-old who loves everything Christmas, and especially remembers her mum as one who always keeps her promises. Then tragedy strikes with the mother was fatally hit by a car. The second scene is about a couple , an airline pilot Mark, and his wife Patty, still grieving after the loss of their teenage son, Sean, also to a road accident. Two deaths, two remaining families, all longing to cling to some hope, any kind of hope. Life is a lot like that. We start off as hopeful beings wanting to make our dreams come true. Along the way, the challenges beset us. The problems befall us, and our sky-high ideals get rudely shot down to earth. Whether in desperation or in despair, we can all testify that at various points of our lives, we do feel that what's often called "ups and downs of life" appears more like "downs and downs of life." Like Emily who lost her only parent she had ever knew. Like Mark and Patricia who cannot seem to get over the loss of their only son. When things do not turn out our way, we can be easily diverted from our original purpose and meaning in life. I know of a friend whose parents thought he had a great future in medicine. The career is good. The future looks bright. Unfortunately, my friend did not like to do medicine at all. He wanted a career in the arts. He had to dragged himself through medical school just to satisfy his parents' wishes. For this friend of mine, he had to divert from his own paths, sacrificing his own hopes in exchange for his parents. Filial yes, but not exactly true to his own calling. Is there room for both? Life is tough. We may argue philosophically to have the best of both worlds, but as we all know, theory is one thing. Reality is the other. William Arthur Ward had famously said: "The pessimist complains about the wind; the optimist expects it to change; the realist adjusts the sails." It is good to let a pinch of pessimism and optimism to balance each other out, just like a floating ball that needs compressed air to blow from all sides in order to keep it suspended in mid-air. The problem is, things can only be balanced if there is an equal dosage of both optimism and pessimism. What if either optimism or pessimism is based not on facts but fiction? Try pumping optimism into a car running out of fuel. No matter how many cheerleaders or pom pom girls you can rally, without fuel, the car will stop running. Optimism and sheer positivity can only get one a short distance. What about injecting pessimism just to bring Mr Happy-go-luck come down to earth? If pessimism is used simply to "balance" out an optimism, the purpose is not truth-seeking but the art of balancing. Try telling a little boy jumping for joy over an ice-cream cone to stop jumping at all, for the world is coming to an end. Killjoy. The realist will take matters into his own hands, believing that if he does not do anything about it, nothing is ever going to change. This matter of fact approach can make things happen physically, but when dealing with matters of the heart, it is a bad tactic. Can we make a heart feel happy? Can we press a button for sadness? That will make a human behave more like a machine. No. We are not machines. When dealing with spiritual matters, it is even more difficult. We are not machines. We are spiritual beings. Physical needs can often be met materially. Emotional needs need emotional sensitivity. Spiritual beings need spiritual guidance. Any hope comes with a cry for help. Even when physically we can run toward all manner of help, spiritually, we need the Holy Spirit to guide us. We need God to heal us. We need spiritual friends to encourage us. The Prophet Isaiah contrasts the need for help in a dramatic manner. In Isaiah 63:15, he acknowledges the LORD God on high who is glorious and holy, zealous and mighty, tender and compassionate. For God is so holy that our response is simply to worship Him in Spirit and in Truth. God is so Powerful that we stand in awe of Him, to fall prostrated before Him. God is a compassionate that we are touched by His love, goodness, and mercy. Then comes the bummer. God restrained his glory, goodness, and compassion from Israel. Why? Why must God withhold his blessings from his people? Three things strike me about our relationship between God and man. Firstly, it is always God's call, not ours. We can call upon God, but God cannot be compelled to obey our call. The words "Look down" is a direct acknowledgement that we are lowly creatures, incomparable to the Almighty God. Sometimes, we tend to take God's Name for granted, thinking that God is a genie bottled up in heaven for us to invoke as and when our needs arise. No. When we seek to listen for God's call, we must learn to wait. We need to listen. In waiting and listening, we are reminded to do all the obedience we can at the present on what we know, and let God do the calling on the future that we do not know. Hope is about trusting God for the future that we do not know, as we faithfully obey the instructions in the present that we do know. Secondly, God's character is full of love, justice, and merciful. Just because we cannot explain some event or circumstance does not mean God has betrayed his love, justice, and mercy. Just because we cannot see any acts of love, justice and mercy now does not negate the character of God. There is always wisdom required in exercising as well as withholding power. For that matter, for every blessing we complain about not receiving, what about the punishment that we deserve that God has chosen to stay his judgment? Hope is about centering our attention on God's character that is always true and faithful. Thirdly, God's "clock" works differently than ours. His timing is everything. Isaiah's prayer is a point in time in which he manages to express his hopes and frustrations before the LORD God. Hope is about learning to trust in God's timing. In true Christmas film fashion, "The Christmas Hope" ends powerfully with a warm touch. As three stories converge, we note how the orphaned Emily gets to stay in her new family. We watch how Mark and Patricia closes the old chapter on Sean and opens a new one in Emily. We marvel at how Dr Andrews helps bring closure by eventually returning to Mark and Patricia a farewell gift left behind by their late son. That is not all. Emily receives a Christmas gift from her late mum, through a video recording, found and then returned to the family. The song left behind goes like this. "You gave me a gift, so I’ll give one to you. See the world with its wonders oh that hope lullabay. As the moon reflects sunlight your light shines on me. It’s all about love, it’s all about giving. Love has no end and no beginning. You live in﻿ me and I live in you… It’s all about love (4x)"
Emily's loss; Mark and Patricia's grief; Dr Andrews and the stranger's return of the gifts; all of them converge to bring hope to one another. Hope happens when our journeys start to converge into one. May our lives converge into the Person of Christ, the True Hope of the World now, and the world to come. That is what Christmas is about: Hope.